How much can you accomplish in just 30 seconds? You name your hero, you’re summoned by the King for help, you defeat the monsters that are plaguing the kingdom, a villain sets up to destroy the planet, the King asks you to save the world, you challenge the villain and lose. While the world is on the verge of being destroyed a Goddess asks you if you want her help to turn back time and beat the villain. Sounds like 90% of the Japanese RPGs out there, right? But if you answer no, the Goddess tells you: “was there ever any RPG that moved on by selecting no?” This happens during the first five minutes of Half-Minute Hero, and that’s when you realize you’re playing a game unlike any other. 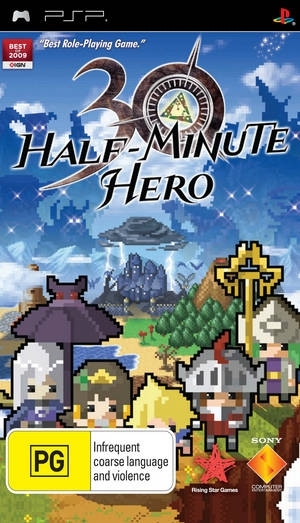 Half-Minute Hero offers several smaller games in one, each with its own type of gameplay, story and characters. The four main modes offer 30 different missions to complete each. 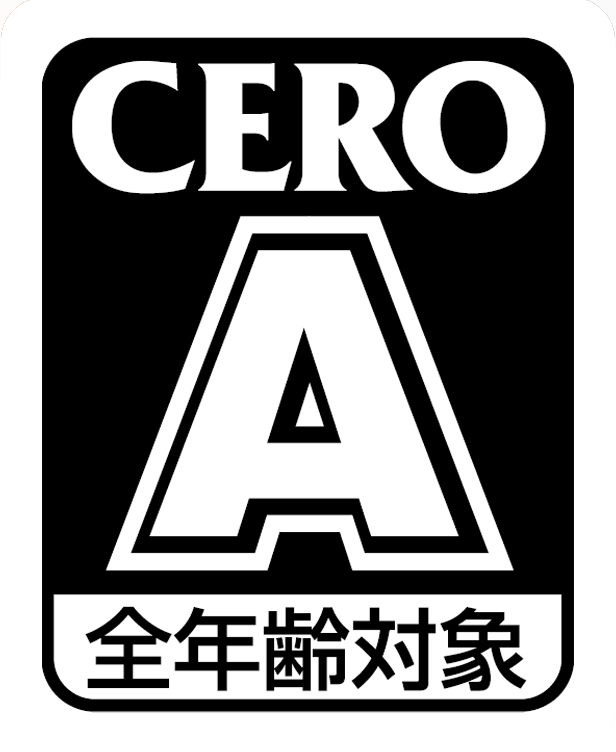 The main one, and the one that will consume most of your time, is called Hero 30. Here, you’ll take command of the hero (whom you can name, as well as the heroes in the other modes) and have to save the world from a destruction spell being cast by a villain in just 30 seconds. And that’s it. Each mission begins with the world on the verge of being destroyed, you're level 1, on a world map that looks like something from a SNES-era RPG and there's a menacing clock marking 30”00. That said, the mission won’t last just 30 seconds, as you have the Goddess of Time at your disposal. For a price (that increases every time you use the service) you can turn the clock back to 30”00. Of course, the option to go back in time doesn’t change the fact that the amount of time at hand is still short, so it’s only logical that the game is hectic. Battles happen at random on the world map, and when you’re in combat your character automatically charges forward and attacks the enemy. In fact, you can’t do anything in battle other than use herbs to heal, flee or speed up. 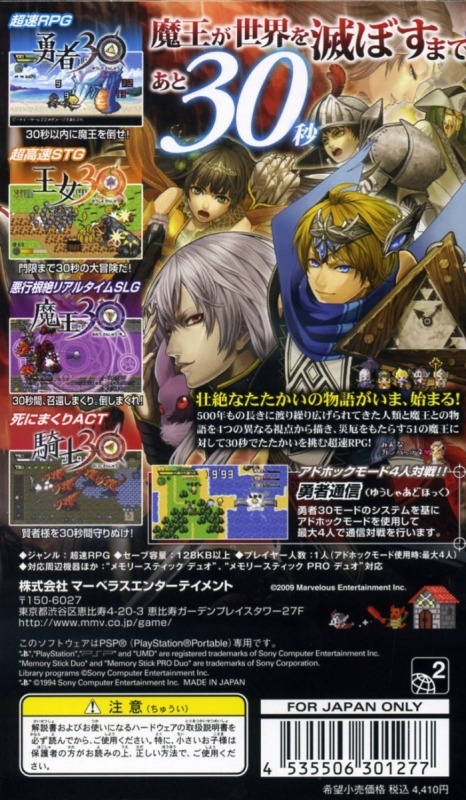 The battle happens automatically and, if your character is strong enough, he’ll beat the enemy without any strategy involved (and when you are strong enough to beat the main villain, a “You > Evil” message will flash, meaning that you always know whether you’re ready to beat him or not). This ensures battles are over in a matter of seconds… a precious resource in a game like this. The only moment you can relax and not have the clock ticking (except when you’re playing on Hard, where you can’t relax there either) is when you enter towns. As in any RPG, towns usually contain shops where you can buy equipment and herbs at inns where you can heal, as well as Goddess Statues where you can turn back time and villagers that have the clues on how to progress the mission. Contrary to what you would expect due to the short amount of time at hand, and in common with most RPGs, getting to the main villain is hardly straightforward. You’ll usually need to do quests that will clear your path. 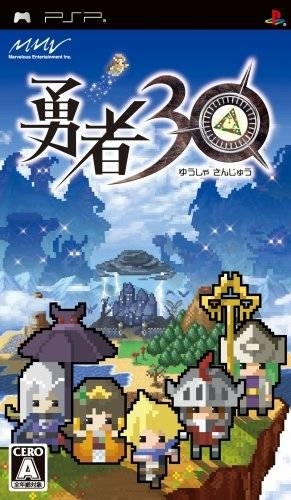 These are pretty much what’s standard in the genre; help the villagers fix a boat so you can get to the island where the villain’s castle is, clear the rock that’s obstructing your path, chase the villain’s castle that moves in the sand (does it remind you of any particular game? ), and so on. These quests are usually simple, and they never get complicated enough to be bothersome, but they’re good at giving you a sense of accomplishment, and ensure that every mission is different. The other modes of play aren’t as deep, entertaining or long as Hero 30, but they can be engaging nonetheless. Evil Lord 30 plays like an RTS - you control an evil lord and you can summon different types of creatures to attack your enemies. Of course, here you have the 30 second clock ticking too and the Goddess ready to turn back time if you give her all the coins that you get by beating your enemies. You can use each of the three face buttons to summon a type of monster, and each type is stronger over one and weaker against the other, in a typical rock-paper-scissors manner. So, in the end it boils down to finding the type of enemies you have to face and releasing the monsters that are stronger than that type (with the addition that if you hold the button for longer you release a stronger and bigger monster compared to if you just tap it). It’s not very strategic, but it can be engaging. Moving on to Princess 30, here the gameplay is more akin to a scrolling shooter, where you are a Princess with a crossbow that needs to reach the goal and come back to the castle before the dreaded 30 seconds are out. You use the D-Pad to move and the face buttons to shoot in the any of the four directions. Here there’s no Goddess statue to reverse time, but there are “carpets”. If you step on one of these it will provide you with some extra time… at the cost of some money, of course. Overall, I didn’t enjoy this mode very much, as it can be a bit shallow and repetitive. Luckily, it’s short and not very difficult, so it won’t trouble you too much. As for the last mode, Knight 30, it’s without a doubt the most difficult of the four (unsurprisingly, since you unlock it after completing the first three). Here, in contrast of the other modes, your objective is to let the 30 seconds pass while protecting a sage (who needs the time to cast a spell to vanquish all the monsters attacking you). You can’t kill enemies, only knock them down for a short time, and then pick them and throw them afar. You can also pick up the sage and carry him around the map to avoid enemies, but he can’t cast his spell while he’s being carried, so the clock will stop ticking down. There’s also a special section on the map where the sage can cast his spell faster, so it’s usually a good idea to get him there and defend that place. Also worth noting is that you cannot die. If you take too many hits you’ll be turned into a ghost, but getting to where the sage is will automatically revive you. There’s one more thing to mention, and it’s your most annoying enemy, a bell (usually multiple) that bothers the sage’s chant, basically ensuring that you can’t beat the level until you knock each enemy down. 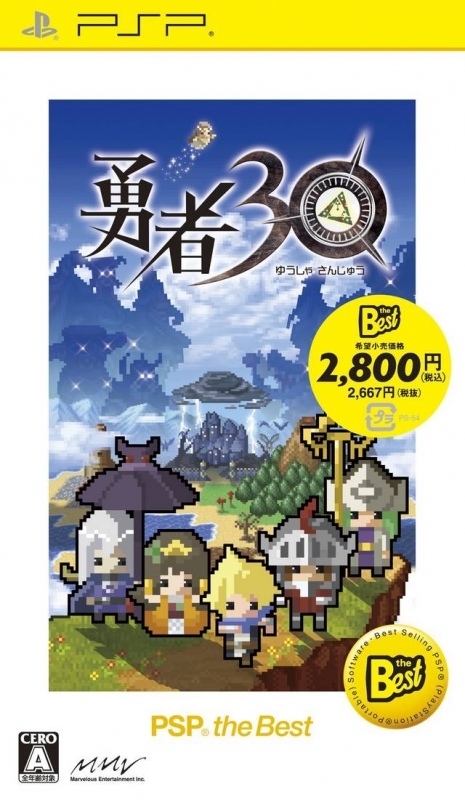 Overall, Knight 30 can get really tricky at times, forcing you to retry levels because the sage keeps being killed, so it can sometimes test your endurance. There are two secret modes, that I won’t spoil, but they’re based on the mechanics of the other modes, so there’s no new gameplay to speak of. 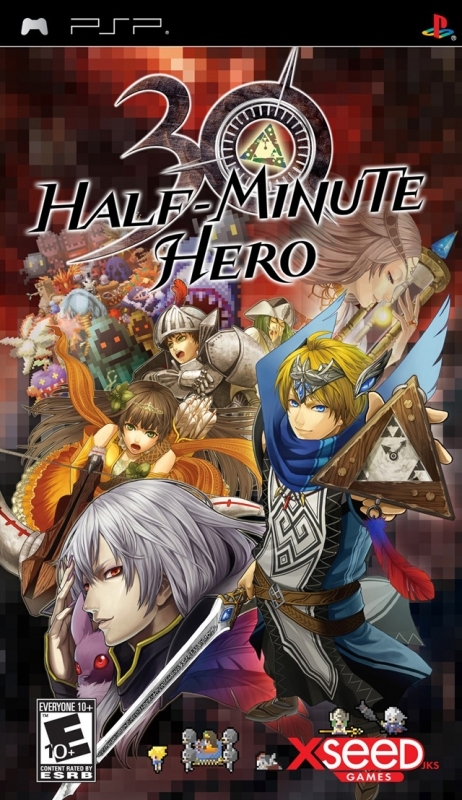 Still, with those six modes all taken into account, the singleplayer part of Half Minute Hero will take around 10 hours to complete, maybe a couple more if you decide to do every extra mission in Hero 30 (there are multiple paths you can take, so the total number of missions is more than 30). 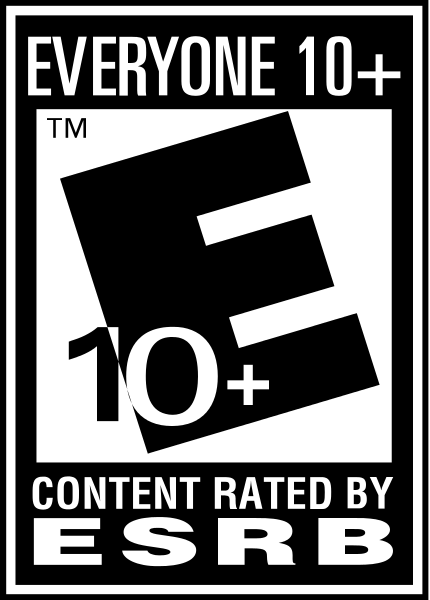 By RPG standards, that’s pretty short, but the frantic nature of the game and the diverse gameplay more than makes up for that. 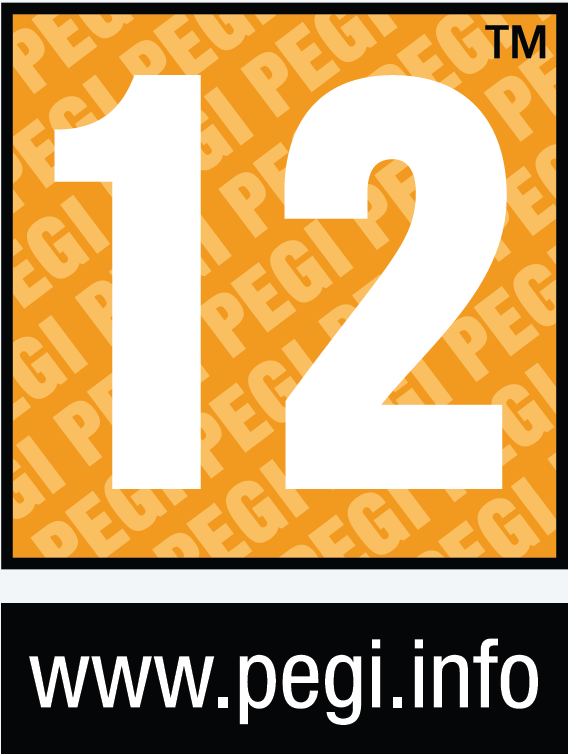 When you’re done with the singleplayer, you can also play the game in multiplayer mode via ad-hoc that supports up to four players. This mode is like a coop version of Hero 30, where all players have to unite in an effort to defeat the boss. This mode can be very fun, but the main problem is that there are only three different maps to play on, so it’s not very long lasting. The presentation side is likely to catch the attention of most, given the decidedly retro look that the game has. While it doesn’t push the PSP's capabilities in the slightest with its very pixelated sprites, the style fits the game perfectly, and it’s hard to fault the game when it’s trying to pay homage to 15 year old games. The music in the game is also reminiscent of retro games, and while it’s not very original or surprising, it does a great job nonetheless. The game’s best part is without a doubt the humor that fills every single corner of it. Half-Minute Hero never takes itself seriously, with characters often breaking the fourth wall, most noticeably the Goddess of Time, who constantly reminds you how you’re experiencing an RPG. In fact, the Goddess is reason enough to play the game, as I found her to be one of the funniest characters in a while, as she never ceases to tell you that she’s helping you because she wants the gold that you can give her. The story may not be full of twists and surprises, but overall it’s so funny and it offers so many references to retro games that it simply must be experienced. It’s no doubt that those with a lot of old-school RPGs in their catalog will get the most out of Half-Minute Hero, as the game is conceived as a homage to them. 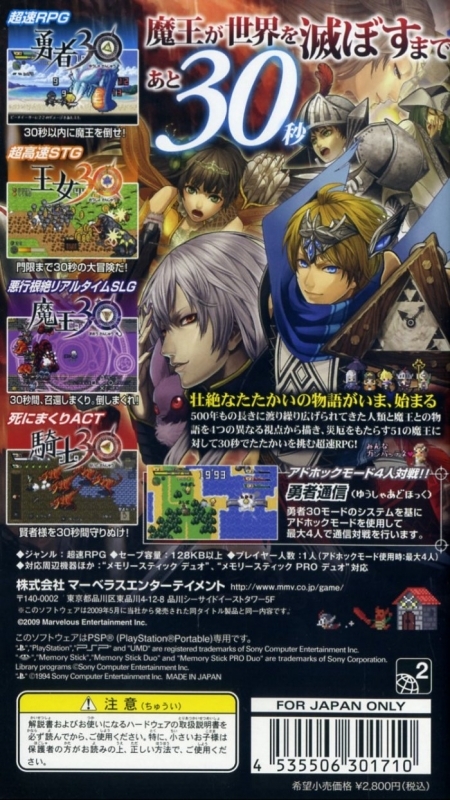 But even those who may not have played them will get a blast from the game, as it offers such unique gameplay that it’s hard not to recommend. 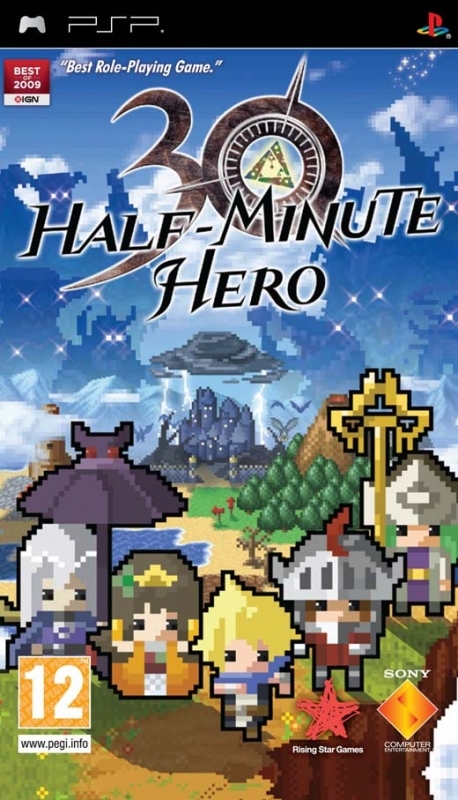 Half-Minute Hero may be pretty short, and the extra modes may not be up to par with the main one, but other than that the game is not only an excellent homage but also a fantastic game in its own right. If you ever wanted a game where the time spent on a random battle is less than 30 seconds, then this game is for you.